Whooooo's Afraid Of The Big Bad Wolf? 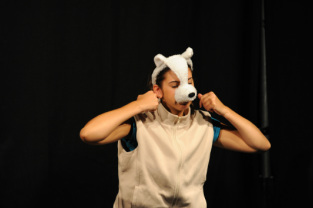 premiered at the Edinburgh Fringe in 2008, and has since toured extensively in schools, community centres and theatres. The Big Bad Wolf is really not all that bad, he's just misunderstood. This delighful insight into his life, performed by a versatile cast of three, will enchant children of all ages, encouraging them to use their imaginations - and voices!